verb: 1. To cause disorder or turmoil in. 2. To destroy, usually temporarily, the normal continuance or unity of; to interrupt. 3. To break apart. I know a lot of us in the Healthcare IT industry are used to filtering out buzzwords to evaluate whether something actually has value or not. Take this buzzword heavy piece of shill for example which is sad, but hillarious because of how earnest it is. I can’t even type the title of “article” because my keyboard won’t take me seriously. If I were playing drinking buzzword bingo to that piece, I would be dead drunk after the first paragraph (mostly dead). Yet, while this is just one example of an inexhaustable supply of muckery, I have to admit, one buzzword still gets me to pause and notice just about everytime: Disruption. The reason why this one gets me is that taken in an academic discussion context about what healthcare industry needs to solve some of its inherent problems (costs, error rates, effectiveness, etc. ), disruption is what is needed. 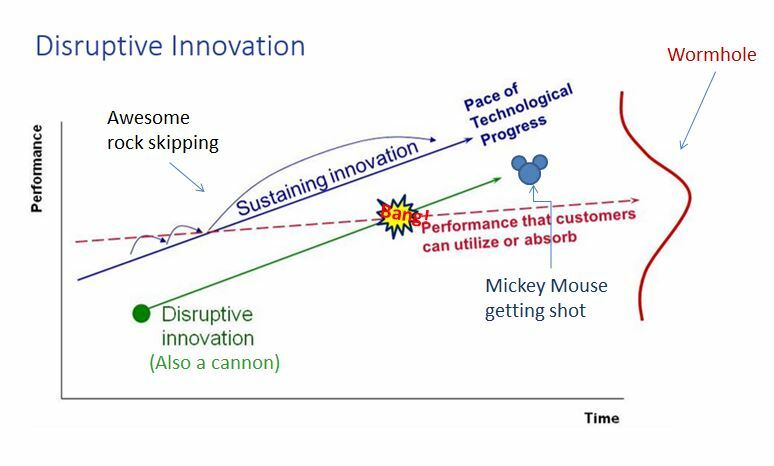 Disruption is a critical factor in the flow of innovation because it pushes the old status quo models up market allowing room for new models that perhaps better serve the industry (Further reading: Clayton Christensen’s Innovator’s Prescription). So when the word disruption comes into my view in reference to healthcare, I immediately perk up because #OMGI’msoreadyforsomethingbigtohappenwithhealthcare… I still don’t fully get hashtags. However, I’m generally disappointed. A prime example is athenahealth’s More Disruption Please program, which despite having the word disruption in the program name does not appear to be doing anything particularly disrupting. From what I can tell, the entire program is saying that athenahealth will allow other software vendors to connect to their software and athenahealth won’t charge them for doing so. Why the way they integrate a voice recognition vendor opposed to how another EHR vendor integrates the same voice recognition vendor is “disruptive”, I have no idea, but their list of “Me Too*” software vendor partners does seem to be growing. And then there is this article that states that throwing money and technology at an industry will always disrupt it. I find it amusing that the author chose to state seriously that blindly throwing technology at healthcare, or a “Tech Attack” as he calls it (again, quite seriously), “…will distrupt the market, driving uprecedented levels of predictive and preventative capabilities and bringing increased transparency into how care is delivered in the United States”. This was interestingly written after a lovely bit of satire was published about how blindly throwing technology at an industry doesn’t actually work. However, despite that, the article is about a paper that came out detailing how the healthcare marketplace is changing, which is actually pretty good. The paper notes that there are 3 distinct movements that are driving change which are the Quantified Self movement, more transparency in consumer markets, and the development of “smart” care teams. I would personally contend that the major benefit of the Quantified Self movement, habit change, is being overlooked as I detailed here. I’m guessing that no doctor wants to look at your obsessively tracked, somewhat meaningless vitals recordings, unless you are currently being monitored in critical care unit or need constant monitoring for a crazy chronic disease. Then there’s this valid point that Apple’s uninstallable HealthKit app which includes weight and calorie tracking actually enables those with eating disorders…so I’m struggling to find how that movement is being disruptive, but I think the other two have minor justifications. Last, I can’t tell you how many times I’ve heard that EHRs are disruptive…but not in the positive sense. Yes, in the early days (Like way back in 2005) many people thought EHRs or EMRs as we called them at the time were going to usher in a new technological healthcare utopia. However, as this Christensen Institute (Yes, the same Christensen as above) article pointed out last year, EHRs have really been put into a disfunctional system and thus, no technological healthcare utopia. Plus bad design, but that’s to be expected in a market with artificial demand. If EHRs were anything remotely close to a positively disruptive Google Search, Uber, Facebook, or iPhone, the entire Meaningful Use program wouldn’t have even been thought of. Otherwise you might be referring to a new tech start-up as, “The EHR of [insert industry subsegment here].” Ironically, the first mention of a government program to encourage EHR use was mentioned in The Innovator’s Prescription under the heading of what not to do. A better word for what EHRs are doing to the healthcare system is enabling; they are enabling the existing system to trundle along as it currently is. Non-Doctor Required Diangosis for 80% of patient issues: When I was going through my master’s progam, this was an idea that those with a medical degree in the program would generally scoff at. A far-fetched Sci-Fi idea that was embodied by IBM’s failure to show meaningful use (haha) of their cancer case diagnosing Watson. The argument against goes, that if you simply take the discreet information offered by the patient and put it into a computer you can never be as accurate at diagnosing because a computer does not pick up on the subtleties of the patient narrative (i.e patient emotions and more importantly, what the patient is leaving out). And it’s true. The deductive process a human doctor goes through may easily be teachable to a computer, but it would never be accurate if you didn’t provide all of the necessary information to come to the correct conclusion. It’s very much the same issue with Big Data right now: the conclusion reached is probably correct assuming you have all of the relevant data…but you most likely don’t have all of the relevant data, so stop pretending you do. However, there is an interesting place where most of the relevant details of a person’s life are now residing: the internet. Target stores got in trouble a while ago when they successfully figured out how to tell which of their customers were newly pregnant and then send them relevant ads. Additionally, social media can give wonderful insight into a person’s emotional state, buying habits, relationships, activities, and location: all of that information is probably more than would be said in an exam room (or more than a doctor would want to actually hear). Combine that with non-doctor ordered diagnostic exams and you might have a winner. Would consumers be willing to let a computer sift through their on-line lives in a semi-anonymous fashion if they could get a quick, accurate, and probably cheap diagnosis? I’m betting they would. Would this be utilized for extremely complicated cases or serious chronic disease? Probably not, because the argument for Sci-Fi AI diagnosing is not for the purpose of eliminating doctors, just removing the lesser burdens on their profession so they can concentrate on the higher-level items. Non-coincidentally, this is pretty much the definition of positive disruption. Anything that can successfully work around needing a medical professional as the sole gatekeeper to the Body of Medical Knowledge will be a step forward. Let’s merge your internet trail of breadcrumbs with the deductive reasoning of a diagnosis. Allowing physicians to connect with each other on their terms: When software programmers need a second opinion they post to a forum like Stack Overflow and get a timely response from another expert (or non-expert, but it’s easy to tell who knows what they’re talking about and users can “vote-up” the best responses) that could be virtually anywhere in the world. In the medical world, second opinions are usually acquired through networks created by health systems, insurance companies, or the phsysical social networks of doctors. There are some vitual networks that have been created like Sermo (by a Finance guy), that aim to create a Facebook for doctors, but sites like this don’t seem to mimic the nature of interaction between doctors passing in the hallway or over drinks. They all seem very…formal. That formalness carries a lot of baggage in the exchange of information and while the strucutre is appropriate for having academic discussions about particular cases and is certainly congruent with the idealized ivory tower image that medical care is supposed to reflect, it doesn’t seem to match up with how I see medical staff interacting behind the closed door of an office in a hospital or at the bar. Remember the story of the guy who tested out a pregnancy test, posted it to the internet when it told him he was pregnant (because he thought it was hilarious), and then someone told him he probably has cancer? While the guy in question wasn’t a medical professional, missing certain details like that because we’re human, happens in the medical world too. Right now, EHRs don’t catch all of that no matter how many alerts they have, but other doctors can. So while a doctor might not post a “LOL, look at this crazy case!” picture to an academic discussion, they may post it to an app like Figure 1, which is full of things like that. While, it’s well within the HIPAA grey area, in addition to having a few chuckles or gasps, there seems to be a lot of actual, under the table consultation happening from what I can see. I have no idea if Figure 1 will usher in a new era of physician collaboration (probably not), but I think skirting that grey area of patient privacy is an important factor in promoting disruption. Perhaps focusing on what’s going on outside of the patient chart may have a greater positive impact than what’s in it. Let’s merge a doctor’s desire to share weird stuff with a smart mob of colleagues willing to weigh in. Untangling the web of medical billing: I’m sure I don’t have to explain what’s wrong with the ridiculous process that is medical billing. The selection of CPT codes, matched up with diagnoses, submission to an insurance company, co-pays, adjustments, rejections, it’s all…pardon the expression, FUBAR. I once tried to pay cash for a doctor’s visit and lab test immediately after they had been completed because I had high deductible insurance and didn’t want to deal with a later bill, but was refused. The explanation of the refusal was for so the claim could go through the insurance company, get adjusted down and deducted off my account’s yearly accumulation just in case I was going to surpass my yearly deductable that year (doubtful) and then back to the clinic so they could send out a confusing bill to meweeks later which I then had the option to pay via check (no on-line payment system at the time) or potentially ignore in case I wanted them to waste money chasing down or selling off debt. To recap: I wanted to give a business cash at the time of service and they refused. By any business texbook, this is generally considered bad business. In Healthcare, however, this whole runaround actually makes logical sense and “benefits” the patient in the sense that they aren’t paying the somewhat arbitrary price set for various procedures by the healthcare organization. This of course doesn’t even touch on the whole approval process of things your insurance will possibly cover which you actually pay for, just indirectly. Check out this fun romp about getting a flu shot paid for. Therefore, anything that successfully unperverts this model and simplifies it down to money being exchanged directly for goods and services. There have been plenty of attempts to do this on small scales, but nothing has reached enough critical mass at this point. Unfortunately, I think this area is so convuluted that an entire dismantling of employer-sponsored health insurance as well as how health insurance operates in general would be necessary. But hey, dentist offices seemed to have nailed the whole pricing transparency issue part of it so maybe there’s hope. Interestingly enough, the electronic patient records and billing software used in dentist’s offices aren’t necessarily more advanced than those used in hospitals and clinics. Let’s unmerge everything about healthcare billing and then give patients a quick, easy, and fair way to pay their providers. Removing the hospital as the center of healthcare: Academic hospitals will probably never go away. They work wonderfully to generate new medical technologies and techniques, adding volumes to the body of evidence that is medicine through research, and performing new or rare procedures successfully. What they aren’t good at is providing easily consumable goods and services to their patients/consumers at a fair price. Right now, the centralized model has been in place to serve as a one-stop shop, ready to take anything that may come. But what will happen when advancements in radiology and lab technology (two big hospital money makers) get to the point where those services in their entirety can be housed in a small clinic? Will the pendulum swing back to physicians striking back on their own again instead of scurrying under the hospital organization umbrella? I’ve already worked in one hospital that outsourced the vast majority of their labs and didn’t seem to miss it. Small hospitals that can’t afford a fancy new MRI, rent them. The real disruption will happen when fewer and fewer people are traversing what we traditionally call a hospital and I think we can all agree that spending the least amount of time possible in a hospital results in lower rates of things like infections. The decentralization of everything that is in the hospital would take a solid underpinning of virtual communication, but I feel like that sort of thing exists somewhere… Let’s merge new and significantly cheaper diagnostic tools with the virtual workplace. The point of all of this is that some new healthcare IT by itself won’t do anything to disrupt the healthcare market. It won’t matter how much you throw at it. Uber solved the technological problem of connecting drivers to customers and making the service easy to pay for. Facebook solved the technological problem of connecting people to each other and giving them a way to share pictures of cute animals and babies. Apple solved a whole host of technological problems we didn’t even know we had with the iPhone. Each one though, had an existing and functional system to work upon and they just had to connect a couple of different items together to make the experience new: Uber merged cashless payments and finding rides, Facebook merged looking at profiles of people on-line with actually interacting with them, and the iPhone merged that mobile thing we make calls on with a portal to the internet and everything on it in a form that made sense. So take note before you bestow the “Disruption” title upon anything in healthcare IT. Is it breaking down and merging new parts together or is it simply providing an electronic way to do something that’s already been done? *A product or service that copies an existing product or service in order to cash-in on a proven market.